. Episode 6 was produced on June 30, 2008. Click here to watch online! If you live in or very close to Palo Alto, California, then you most likely be able to watch it on television! Click here to find out. This episode won the 2008 WAVE awards for the "best instructional" TV show category. There's a lot of fun stuff in this episode! 1) Learn about space/trapped pieces from Barbara's game which was published in the November 2001 Chess Life magazine. 2) See a special video about chess in the community. Chess is all over the world! See giant chess boards in New Zealand and Europe. 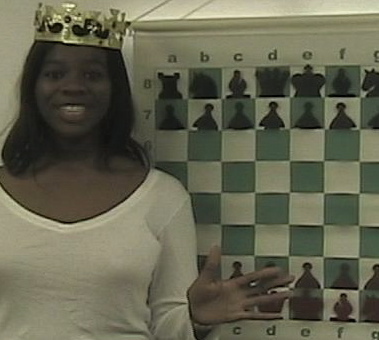 The video also features our chess fans' photos too! 3) See a nice video on Alisha Chawla, a 7 year old girl chess player from northern California. She is a top chess player who will represent the USA in Vietnam later on this year. 4) In the TV studio, meet Jessica Lauser, who is the highest rated blind woman player in the USA. She talks about how blind people can play chess. Jessica also recently played in the USA 2008 blind championship.